First, THANK YOU to all who wrote letters, sent words of encouragement, and came to the Planning Commission hearing on September 29th to speak about the future of the land we farm. Your comments were incredibly moving and important. 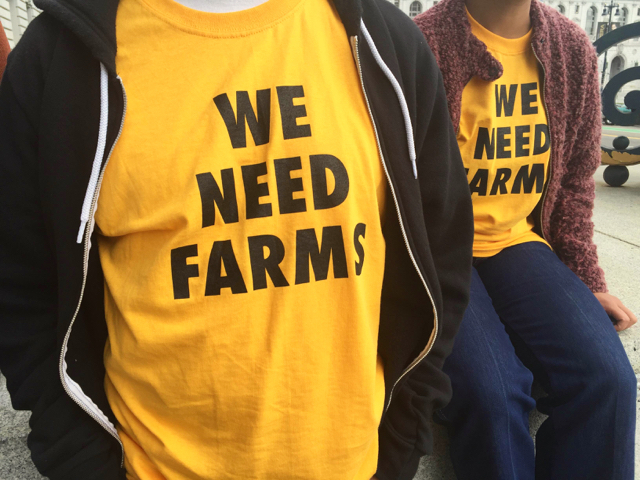 While the outcome is discouraging on many levels, the outpouring of support and engagement in this complicated issue was a testament to the need for farm space in San Francisco, and a celebration of all we’ve collectively created and advocated for in the past 6.5 years. The hearing room was filled with a sea of yellow shirts, and there were so many attendees that there was an overflow room opened downstairs where people watched remotely from a television, waiting to be called upstairs to speak. Sadly, after 3+ hours of public comment, with close to a hundred comments from neighbors, fellow farmers, and urban agriculture advocates in opposition to the development of this land, the commissioners voted 7-0 to approve (with conditions) a Conditional Use permit that allows for a deviation from zoning and the development of a 200 student school at 203 Cotter Street, one of our city’s last remaining farmable parcels. The hearing was long and difficult. Parents and teachers from the school, guided by lawyers and consultants, delivered emotional arguments about the need in San Francisco for alternative models of education. There were descriptions of the warmth and love the Golden Bridges School community provides many families, coupled with amplified fears about our public school system. Parents spoke to the benefits of city children having access to the outdoors, and many parents threatened to leave the city if this development were not permitted. Neighbors argued passionately that this site is simply inappropriate for the school’s size. Several showed photos of their flooded homes due to the inadequate sewer system in the neighborhood (see here), and argued that the scope of the school on this former creek bed would exacerbate these issues, being too densely populated for what the neighborhood’s infrastructure can handle. Traffic and safety were also repeatedly raised as major concerns for the narrow, one way street. Neighbors described the positive, low impact benefits our farm has had on the neighborhood. Farm advocates, including Little City Gardens interns and volunteers past and present, the SF Urban Agriculture Alliance, The Garden for the Environment, community gardens and local businesses, supported neighbor concerns and urged commissioners to consider a working farm as the most appropriate and publicly beneficial use of this unique space. 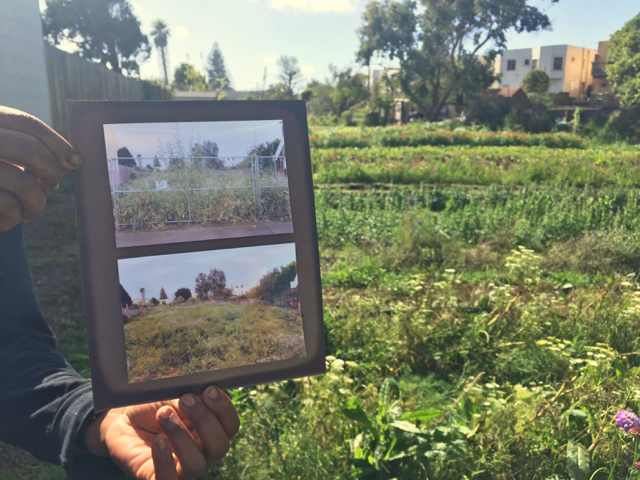 We spoke to the powerful experiences and educational opportunities available through a working urban farm, pointed to the ways the City has recently made commitments to urban agriculture, and reiterated the scarcity of suitable farm space in San Francisco. We argued that this property, and its current farm use, is representative of incredible momentum in the urban agriculture movement in recent years, and to change its use, build atop the soil, and close the gates to the public will be a significant loss to San Francisco. We described our past work with land trusts and public agencies around possible purchase, and we expressed confidence in our ability to resume this pursuit if given the opportunity. We also noted that the school’s values are admirable and deserve support, but reminded that while a school can find a home elsewhere in the city, a farm largely cannot. Many commissioners spoke of the difficulty of the decision, recognizing the situation as the complicated weighing of two policy priorities for San Francisco. Commissioners acknowledged the proven benefits of a farm, and several made clear that the scope of the proposed school campus indeed felt intense for the space and the neighborhood. Tasked with determining the necessity, desirability, and safety of the proposed use of the site, they felt mostly satisfied with the environmental impact studies included in the proposal, save a few conditions the school must adhere to moving forward. In the end, they expressed a lack of evidence for a viable alternative use, and voted to approve the proposal for fear that disapproval would pave the way for an eventual condo proposal, which they argued would be an even bigger departure from the property’s current, widely supported farm use. To me, the outcome of the hearing, as disheartening as it is personally, indicates the sorely imperfect nature of our city’s decision making capacities, and the ways in which this particular process, like so many others, is centered around those with capital. The Planning Commission, a reactive body with limited discretionary power, responds only to proposals placed in front of them — in many cases, including this one, a proposal refined and packaged by a property owner’s professional team who are in the business of knowing what will be most palatable to commissioners. The buying power to purchase property, plus the additional resources to hire planning and public relations consultants, gives an undeniable upper hand. Capital begets momentum from the beginning to the end of this process, and the rest of the story is shaped from there. Toward the end of the public comments, a school parent and prominent committee member offered some of the last words of the day. He implored the commissioners to disregard the opposition’s pleas for a continuance on this proposal (the postponement of a vote until further environmental review is conducted), stating, with a shrug, that these pleas were merely a “political tactic.” Yes, they absolutely were. Genuinely, and necessarily. Golden Bridges leaders, I ask you to not ignore the political tactics steeped into your own narrative, to not downplay your collective position of privilege and power in this complex conversation about a rare, beloved and already activated piece of land, and to not diminish community members’ rights to oppose your plans for this property. Land use is rightfully regulated for appropriateness and public benefit. As I’ve said before, this conversation has never been an attack against Golden Bridges’ values, nor is it a personal opposition to any of the kind, well intended families or teachers within the school community. Simply put, the land that you want to build on is in a flood zone, oddly shaped, and surrounded closely by neighbors’ bedroom windows. And it is an incredibly well loved place. The outcome of this hearing has been viewed by many as a profoundly missed opportunity by the City of San Francisco. Neighbors of 203 Cotter Street will be appealing the Conditional Use permit to the Board of Supervisors. And for Little City Gardens, sadly, it’s time to wind down. This month, we will continue harvesting the last of our fall crops, and beginning next month we will start the heartbreaking task of packing up the farm and saying goodbye to this piece of land — home to 6.5 years of vision, experiment, dialogue and hard work. We’ve been asked to vacate 203 Cotter by December 15th. I could never have imagined how hard it would be say goodbye to this place. Connection to land is a powerful thing, and the strong and intricate community that has formed over the years, evolving and growing with each person who passed through, has forever changed this place, I can feel it strongly. Many wonderful hands have touched this soil. As an aspiring farmer/food provider, Caitlyn and all the other members and volunteers at Little City taught me about soil, farming techniques, and helped me develop my ice cream pop-up business, Churn Urban Creamery. It was the inspiration that I gathered from this space and these people that pushed me to start my farm-to-scoop ice cream business. Above is a small selection of some of the powerful letters and public comments submitted for the hearing. A very sincere thank you to all who have contributed to these efforts, now and in the past 6.5 years. Your support, energy and passions are deeply appreciated. For the record, as one of the parent’s who spoke, I saw no evidence of any parents being “guided by lawyers and consultants”. For the most part I saw parents speaking from the heart, just like the neighbours and the LCG crew. I’m sure that doesn’t make it any easier to deal with, but that was the truth. God bless and I hope the farewell party is a sweet event blessed with some gentle, warm sunlight. This news is heartbreaking. Martha has been keeping us up on the birth and growth of Little City for a long time. As one who has quietly applauding its life, so devotedly attended by Caitlin, I just would like to assure Caitlin that herefforts will always be an inspiration to those who knew of it or participated in it. Caitlin and her volunteers and supporters have given a little piece of life to the world, and we’re very grateful.